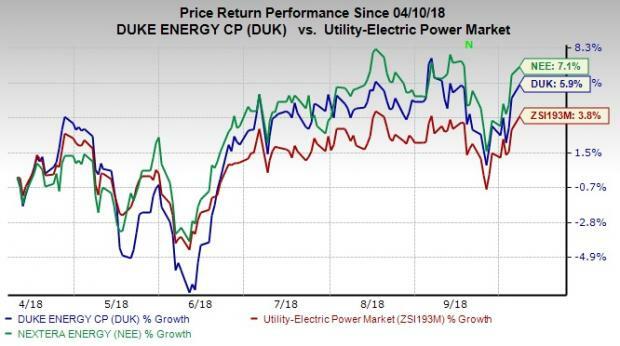 NEE or DUK: Which Utility Stock to Hold Before Q3 Earnings? Utility provides basic services and is not affected by volatility in the market. Most Utility companies are mature, fundamentally strong and focused on domestic as well as industrial usages. These companies are generally regulated, generate power as well as operate transmission and distribution lines. Consistent investment is required to upgrade, maintain and replace older wires, electric poles as well as power stations. These stocks are capital intensive, at the federal and state levels. Steady performance, stable earnings and cash flow enable these companies to reward investors through regular dividends. It is an appropriate investment option for systematic long-term income. The Zacks Utility – Electric Power industry’s dividend yield of 3.22% is higher than the Zacks S&P 500 composite’s 1.82%. However, investors should also be aware of weaknesses in the industry. Stringent emission rules, weather fluctuation and higher debt loads amid rising interest rates are major concerns for utilities. In this write up, we run a comparative analysis on two prominent electric power utilities — NextEra Energy, Inc NEE and Duke Energy Corporation DUK — to ascertain which one is a better option to hold. NextEra Energy, carrying a Zacks Rank #3 (Hold), has a market capitalization of around $ 81.29 billion and is among the leading Electric power companies globally. You can see the complete list of today’s Zacks #1 Rank (Strong Buy) stocks here. Duke Energy Corporation, holding a Zacks Rank #3, has a market capitalization of $57.99 billion. NextEra Energy outpaced the Zacks Consensus Estimate in three of the trailing four quarters, with an average positive earnings surprise of 3.01%. Duke Energy also delivered positive earnings surprises in three of the trailing four quarters, with an average positive earnings surprise of 1.70%. NextEra Energy has an edge here. Shares of NextEra Energy have gained 7.1% and Duke Energy’s shares have improved 5.9% compared with the industry’s rise of 3.8% in the past 6 months. The price movement of NextEra Energy is better compared with the same for Duke Energy. The debt-to-capital is a good indicator of the financial position of a company. The indicator shows how much debt is used to run the business. NextEra Energy has a debt-to-capital of 43.94% compared with the industry’s 49.64%. Meanwhile, Duke Energy has a debt-to-capital of 53.98%. NextEra Energy wins this round. ROE is a measure of a company’s efficiency in utilizing shareholder’s funds. ROE for the trailing 12-months for Duke Energy and NextEra Energy is 7.92% and 10.49%, respectively. Both the companies have outperformed the industry’s level of 7.06%. NextEra Energy has an edge over Duke Energy. Utility companies generally distribute dividends. Currently, the dividend yield for NextEra Energy is at 2.58%, lower than 4.56% of Duke Energy. Duke Energy’s dividend yield is higher than the industry’s 3.22% and it wins this round. In terms of long-term earnings growth expectations, NextEra Energy outperforms Duke Energy. The expected earnings per share growth rate for NextEra Energy for the next five years is pegged at 8.38% compared with 4.64% for Duke Energy. Our comparative analysis shows that NextEra Energy holds an edge over Duke Energy in terms of earnings surprise history, price movement, debt-to-capital, ROE measures and long-term growth expectations. However, Duke Energy has an edge in terms of dividend yield. As the scale is tipped in favor of NextEra Energy, it is a stick that should be retained in a portfolio.